Just returned from a trip to Osmanabad in the Marathwada region with mother. The 6-hour road trip each way was a delight, but only after we made our torturous way in and out of insidiously ever expanding outskirts of greater Hyderabad. High-rise futuristic buildings, multi-lane, dual carriage expressways and fly-overs of the High-Tech city of Cyberabad give way to a single road winding its way through black or red soil bordering fields - a rich patchwork tapestry in verdant, russet and golden colours. My grandmother used to liken it to irkal fabrics; the rich sienna or rusty red soil bordering the geometrically patterned green and yellow body of woven silk! The weather couldn’t have been more clement. It was cloudy just like I like it. Not overcast and ominous, but gentle – as if playfully and affectionately shielding the sun-baked fields from the glare of the sun. The alternating wet stretches of the grey graded road, the fragrance of the wet soil, and a rainbow rim on the horizon are the signs of the sun conceding to the clouds. Red roadside rainwater puddles and streams remind me of what we kids used to call “chaha chi nadi” or rivulets or ponds of boiled chai latte! The lush, tall feathery sheaves of the kharif crop of jowar swing gently in the moist breeze, gossiping lazily with the tuvar dal in the neighbouring rows. Were they gossiping about the foreigners in their midst-the snooty sunflower and soya bean plants that show off their upmarket cash crop status? Our eyes are soothed by the emerald swathes. Our hearts are cooled in homecoming. It’s lunchtime and Mother and I hark back to the foods that we ate in such environs. Of course, it has to be jowar roti brought to the fields by the farmer’s wife in a basket wrapped in a soft muslin cloth. Accompaniments are not fancy, but most exotic - raw onions smashed with the fist (mukka onion) or tender spring onion, green chillies plucked from the plants growing within the ranks of the crops and a clump or rock of salt! In winter, when the farmers light a bonfire of the dried hay from harvested crops, they just chuck in some brinjals, sweet potatoes and potatoes to roast in the skin, peel and enjoy them with bhakri. And that reminds me of the hurda parties we used to have in the fields in early January, when sheaves of tender jowar are thrown into a bonfire of cow dung cakes, roasted and then de-husked while rubbing the sheaves vigorously between the palms. The roasted milky grain is relished with hot garlicky peanut, sesame or copra chutney! Reminiscing about our rustic roots, I tell mother how I recreate this romance in Melbourne. It’s unique quality is that it can be as light as or as filling as you want it to be. And it tastes equally good cold as it does when it falls straight from the tava into your plate! Jowar is gluten free, so it’s a good option for those with celiac disease or gluten allergy. But that makes it tricky to make bhakri because it can’t be rolled with a belan and needs to be patted with hands. 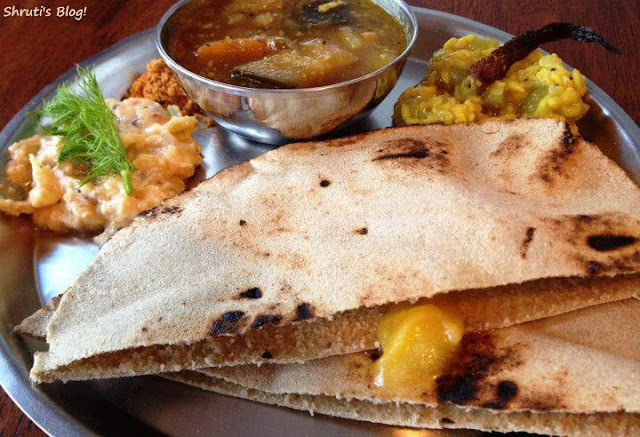 Moreover, the bhakri is very hard to make if the flour is very old and then needs hot water to mix the dough. But I have come up with a good solution to get around this problem! 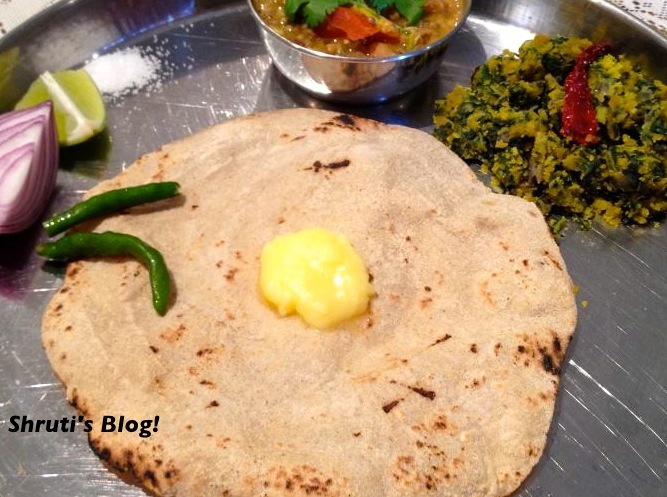 Don't be scared by the seemingly complicated method- the roti is made just like a phulka. Read on…. Mix the flours and keep some aside for dusting. Add salt and add warm water to the rest of the flour mixture and knead it for a few minutes into a semi-soft smooth dough. Divide the mixture into large lemon sized balls. Roll out one roti at a time with a rolling pin, dusting the roti and the board generously with the flour. Take care to roll it thin on the sides and slightly thick in the centre. Lift the roti, dust the excess flour and flip it face down on to a medium hot tava. Brush the top of this roti with the cool water using a pastry brush (I use my hands) taking care not to make it too wet, but ensuring that the entire face of the roti is moistened. As the lower side gets cooked, the roti will leave the sides of the tava and it’s time to gently prise it free and lift it with a spatula and flip it over. After this side is cooked for a minute or so (or until light brown spots can be seen when you lift the roti), remove the tava from the heat and place the roti on the flame moving it to make sure the roti puffs up (like phulkas). Once this side is done, quickly flip it again to roast the bhakri on the other side. 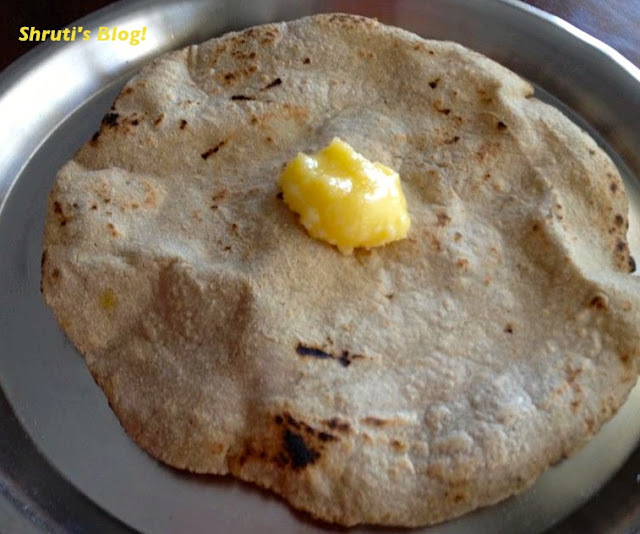 The puffed up bhakri is like a pita bread or phulka – a good bhakri will have pocket formed within the two layers, the bottom layer slightly thicker than the top one. Serve with white butter or ghee with greens, bharwan baingan, usal or pithla (jhunka). यांच्या बरोबर एका ताटात असायला नशीब लागतं !" What a heart warming post Shruti. :) Thank you Sangeeta! Cherish that cob - it's a reminder of the lovely days of yore! Thanks for the Bhakari tip.. I will try this new version for sure..